The story of the Shakers is one which stuck around with me for a while after I left their village. Partly, I was charmed by Pleasant Hill, where they made their base - a charming rural patch of land in Kentucky, lined with stone walls and undulating fields. But mostly, I was intrigued by their history. They were an interesting lot. One of the theories as to how they got their name relates to their method of worship. They would dance, sing, stomp and bash around until they were completely exhausted and incapable of any more action. All of this kerfuffle would shake the wooden buildings where they stood, and echo into the valley. They also lived completely celibate, segregated lives - men and women even used separate entrances. Couples who joined the Shakers together would be separated. This meant, of course, that there was a bit of a problem, numbers wise, after a few years. So they recruited locally. They lived fairly simple, hard-working lives, out in the fields by day, worshipping at night. Which is all well and good, but I wanted to hear all the dark secrets they kept. So I was happy to hear, after a gorgeous dinner in the Trustee's Office, that there was a night time tour being led around the grounds, all the way to the cemetery. Jonathan led the way, and we all strolled with our lanterns, throwing flickering shadows along the pathway. By the way, it's incredibly difficult not to swing a lantern, even when you've specifically been told not to (it is fairly risky). I swing my arms a ridiculous amount when I walk anyway, and when you're holding something that feels suspiciously like a pickernic basket, it's all you want to do. But back to the walk. The old houses at Shaker Village are gorgeous and classically American in style, right down to the white picket fences. 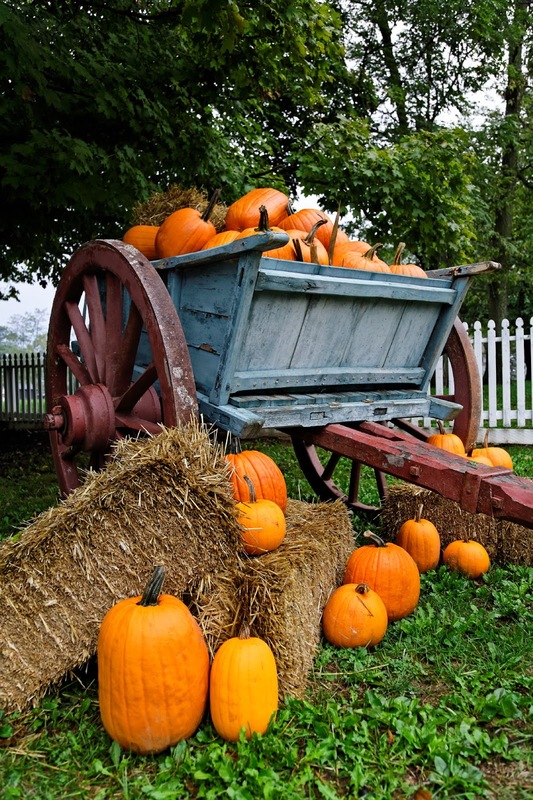 As it was nearing Halloween, pumpkins were dotted by most of the gateways, piled against each other in an Autumnal heap. I thought the walk would feel spookier than it did - it was, after all, dubbed the Spirit Stroll. But there were no goosebumps or chilling breezes. Jonathan read passages from the diary of a shaker, telling us about ghostly visitors, spiritual visions and the dark days in the village. There were tales of drunken locals storming into the camp, bearing clubs and weapons, and taking a girl with them as they left. "Sabbath they came on again, between two and three hundred in number, arrived as before, with the addition of their clubs being tied fast to their wrists, and many of them having their dirks fastened in the ends of their clubs, and their shirt sleeves rolled above their elbows." There were fights within the shakers which ended in death, drunken prostitute invasions, suicides and mysterious pregnancies. When we reached the cemetery itself, we were told of the last remaining Shakers, who attended funerals as a dwindling group of seven in 1913. There were no headstones in the field, though it contains around 400 graves. "Two of the remaining seven are old ladies, both over ninety years of age…it was a pathetic sight to see the two looking with tearful eyes upon the caskets containing the bodies of their life-long friends, and many and tender must have been the memories it stirred within them." There's a poem in the Old Stone Shop, and no one knows who wrote it, or where it came from. A woman who left her lover for the Shakers? Or who joined with him, only then to live a life of celibacy? Either way, if another girl did get pregnant while in the community, I bet she was a little bit peeved. We finished up the stroll in the Meeting House, where the worship would have taken place. The subject of ghosts came up, as we sat in the darkened room. There have been stories of ghostly figures appearing in the house, particularly when someone sings in the echoing space. But Jonathan would rather believe that the Shakers are alive within everything at the village, their furniture, their tools, their diaries. And that's much better than a spooky aparition in the corner of a shadowy room. You can read all about Shaker Village here: www.shakervillageky.org I'll also have a review up next week of the gorgeous room I slept in. You can also read my feature about Kentucky on the Irish Independent website.